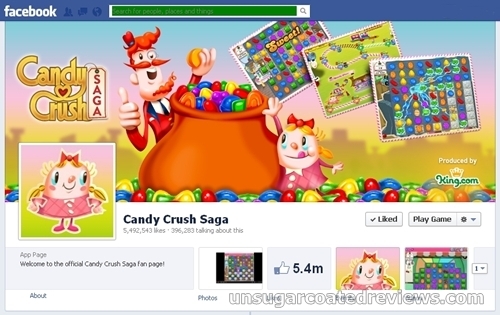 I am one of more than five million people currently addicted to a casual game called Candy Crush Saga. It is a single-player puzzle game, a match-3 game to be exact. 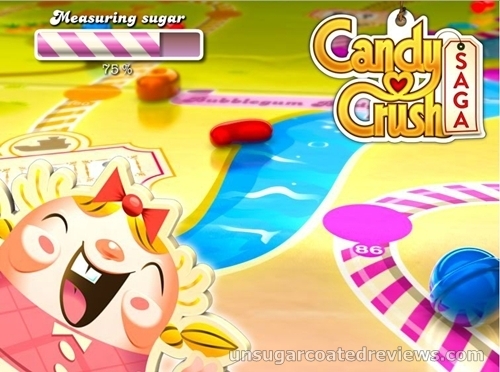 According to Inside Social Games, as of November 2012, Candy Crush is the No. 4 Facebook game (and top King.com game) in terms of daily active users. 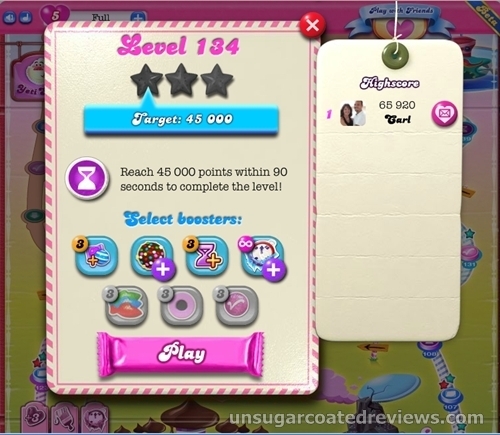 Candy Crush Saga currently has more than 200 levels and more levels can be expected since many players have already reached the highest level and are clamoring for new ones. 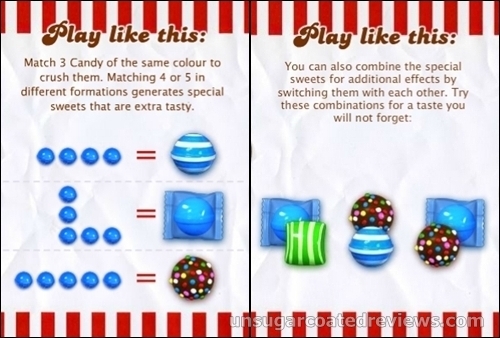 To crush candies, the player must match three candies of the same color. He gets special candies whenever he matches four or more similar ones. Different levels have different goals. For timed levels, a player must reach the target score within the time limit. For other levels, the player can play slowly as long as he reaches the target score and fulfills the given goal (e.g. 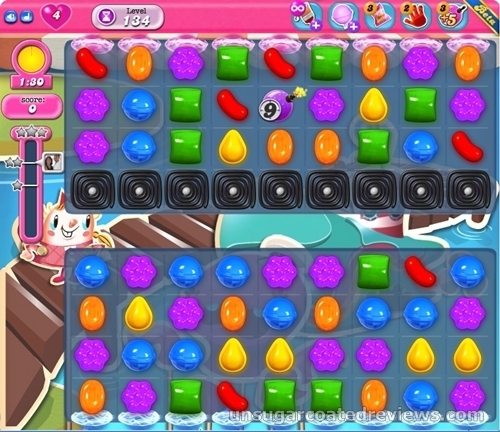 clear all the jelly, bring down the ingredients, collect the special candy combos) within the allowed number of moves. 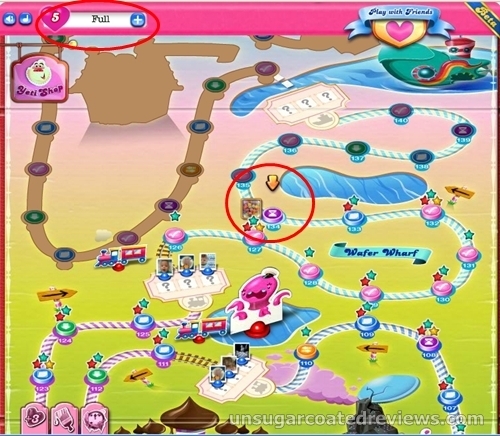 If the player fails, he is given the option to end the game (lose one life to restart the level) or to play on (continue playing by paying Facebook credits). Looks great. 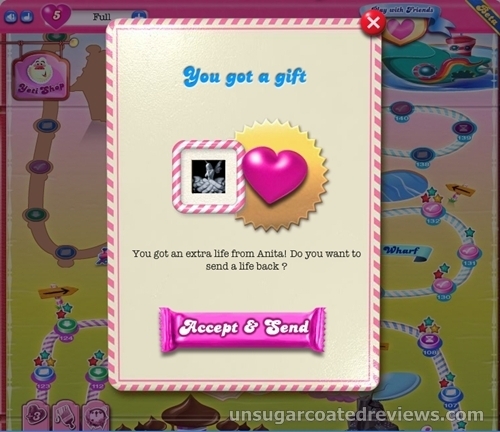 I'm not sure what to call the artistic style the developers use for Candy Crush. The word vaudeville comes to mind but I'm not sure if that's an accurate description. Whatever it is, this game is very pretty and has great sound effects and music. Very addictive. I give extra props to stuff that I enjoy more than I expected. There are tons of free match-three games online but I had always thought of them as a bit juvenile so I ignored them. Candy Crush gave me a newfound appreciation for such games. It is highly addictive and very challenging. If you'll look at the comments on their Facebook page, you'll see a lot of people complaining that they are stuck at certain levels for weeks (or sometimes even months), yet they keep on playing. I myself spent two or three weeks at levels 65 and 70 and am currently stuck at level 134, yet I have no plans of abandoning this game. Social but not suffocating. There are a lot of games out there that are fun but require you to have a lot of friends who are also playing the game. For many people, that is very frustrating. Your real-life friends who don't play the game hate you for bombarding them with requests and updates and will probably block/report/unfriend you. There are groups and forums where you can add strangers who play the game but of course that can lead to security breach of your account or getting reprimanded by Facebook for sending a lot of requests and adding people who are not really your friends. (This is very annoying since the game company notorious for introducing this kind of demanding gameplay is Zynga, one of Facebook's biggest partners, yet Facebook punishes the players instead of punishing Zynga for pushing people into adding complete strangers as friends.) 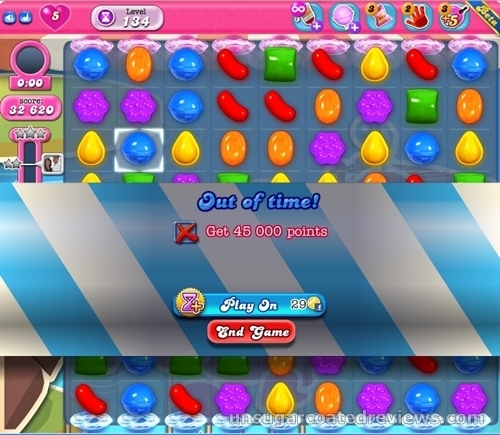 Anyway, Candy Crush Saga does not have this problem. Every 15 or 20 levels, you have to ask your game friends for three tickets to unlock the next chapter, that's it! Since you only need three tickets and advancing 15 or 20 levels happens only once every few weeks, it won't be hard to find real-life friends who will help you out, whether or not they play the game. Not a timesucker. There are many Facebook games that I enjoyed but had to give up because they ate so much of my time: Mob Wars, Mafia Wars 2, The Sims Social, The Ville (which suspiciously looks a lot like The Sims Social anyway), Disney's Ghosts of Mistwood. 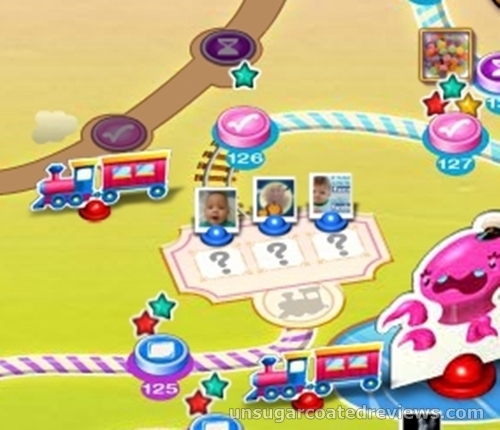 Unlike them, Candy Crush Saga does not take up much time to play. Gameplay is fast and you only get 5 lives, with the puzzles hard enough to use up all those lives each time you play. Afterwards, you get one life every 30 minutes, and since there's nothing to do, no neighbors to help etc, there's not much temptation to linger after using up all your lives. It is not a perfect game. Every now and then, the developers tweak something in the game and the game doesn't load properly. Then there's that issue about extra lives: if you already have five lives, any extra life you get from your friends is unusable. Why have you posted on fb that if you 'like' 'share' and then say 'thanks I have 100 lives' when actually you don't? Very annoying!!!!! Do NOT download this game. I am laying awake at night seeing these bloody little squares over and over and over and over and over. And don't get me started on that frigging song!!!! AAAARRRGGGGHHHH!!!!! Just like you, my bf said the same thing about closing his eyes and seeing those candies in his mind. I looked it up online, it seems to be an actual medical condition called Tetris effect. Game not loading again!It gets to 29%then just sits there!!!!!!!!!!!! Please add and send me tickets. I will send u back and give u lives. Fb username : sophia rebecca. Hi are you accepting the lives from your friends when you already have five lives? You can leave them as a message untill you need them.